and is a former reporter for the New York Bureau of the Associated Press. Hoffman is the author of several books, including his masterwork, Judaism Discovered. His free newsletter, The Hoffman Wire, is sent out weekly to thousands of supporters. Brother Nathanael Kapner: Israel launched an air strike against Hamas in the Gaza Strip on December 27, 2008. The invasion has now expanded into an all out war with no end in sight, complete with Israeli ground troops and reserves slaughtering hundreds of civilians. What are your opening thoughts on this? Michael Hoffman: As usual, the Israelis in Gaza are taking a crap on an entire people. The IDF is dismantling, not so much Hamas, but the infrastructure of Gaza’s government. We are seeing housing, the educational system, and Gaza’s fire-fighting & medical facilities, systematically being dismantled by Israel. This is not a limited attack on Hamas as the Israelis spin it. This is an attack on the Palestinian people’s ability to govern, educate, house, and protect themselves. Br Nathanael: Israel is defending themselves against criticism of civilian deaths by saying that Hamas is “using civilians as human shields.” What is your response to this? Imagine if in Oakland, California, African-American guerrillas fired rockets at Sacramento in protest over the killing of a black man by transit cops. In response, the California National Guard attacks an all-black school in Oakland, slaughtering 40 children because the rocket-firings by the militants took place “near” the school. Would the world forgive California for the deaths of the children in Oakland because black militants had been firing near the school? Such a racist devaluation of the lives of the black children collectively punished for acts of armed resistance by guerrilla fighters in their neighborhood would appall and shock the world. Yet, this is what occurred at the UN school in Gaza after Hamas fighters allegedly fired mortars in the vicinity. But Israel commits atrocities like this with impunity. Br Nathanael: Is there a racist and religious component involved in Israel’s massacres of Palestinian children? Michael Hoffman: The racist component of the devaluation of Palestinian life, so evident in Gaza, is barely mentioned because it tends to show that the Judaic state of Israel is sick at its core. Any such admission would tend toward an investigation into the roots of the Zionist pathology which, patently, are in the religion of Orthodox Judaism. For Orthodox Judaism institutionalizes the enshrinement of the humanity of the souls of Judaics while derogating the humanity of non-Judaic souls. Br Nathanael: But what about all of the “Torah True Jews” who are against the Zionist State of Israel? Should we be applauding them? Michael Hoffman: In the last stages of Judaic propaganda surrounding any massacre by Israelis in the Middle East, we witness the phenomenon of “Jews Against Zionism” and “Rabbis for Peace.” Attention given to these groups by the Judaic-controlled media intends to deflect attention away from the Talmud and other rabbinic texts which teach that when necessary, non-Judaics may be killed with impunity because they are not fully human. 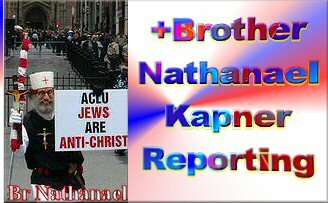 Br Nathanael: Hasidic Jews are always publicly protesting against Zionism? Are they to be commended for their Anti Israel stand? Michael Hoffman: The masters at this sort of disinformation are the Neturei Karta sect of Hasidic Judaism who were received by the Iranian President at the revisionist conference in Tehran. These people parade around the US and Europe condemning Zionism as being against “the Torah.” But what they mean by “the Torah” is Judaic “Law” as explicated by the Talmud - not the Torah of Yahweh, which the rabbis nullify. Neturei Karta and the larger Satmar body of Hasidim, who are also anti-Zionist, are a function of the Cryptocracy at one of its highest levels of operation. The many befuddled “goyim” who cooperate with these groups in disseminating the propaganda that the Talmud is a document of peace and love inimical to Zionism and the Israeli state, serve to rescue the religion of Judaism from the odium it so richly deserves as the ideological engine that drives the Israeli war machine. Br Nathanael: Do you think a boycott of Israeli goods will finally stop the atrocities continually carried out by the state of Israel? Michael Hoffman: The Arab world and the West are currently repeating their useless pattern of issuing the same tired and impotent protests and resolutions. Effective action and remedies are never put into place: the Israelis have too strong a hold on western institutions to be dragged before European courts for war crimes’ prosecution as the Christian Serbs were, or to become the target of “boycott” campaigns, as were the whites of South Africa. Br Nathanael: What then can we do to stop the continual blood baths by Israel? Michael Hoffman: The Israeli hold on the West can only be weakened and eventually dissolved if the world will come to view the connection between Orthodox Judaism and Zionism the way it perceives the connection between Islamic fundamentalism and Al Qaeda. The actions of the Israeli military in Gaza — mass murder and constantly lying about it — are derived from the rabbinic law of Orthodox Judaism, as documented in my book, Judaism Discovered. This is the missing element in the analysis of Israeli war crimes and deception. 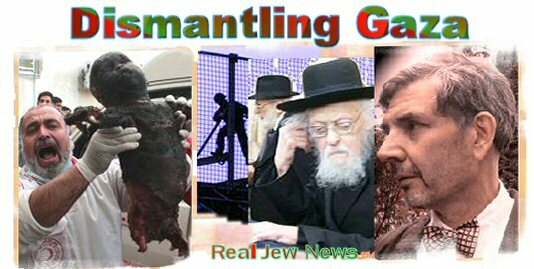 The rabbis teach the followers of Orthodox Judaism to lie and, when it is deemed politic, to slaughter dehumanized non-Judaics. Until this is widely understood, the Israelis will massacre civilian populations repeatedly and with impunity, as the history of the Zionist state, and now in Gaza, demonstrates. I am so glad I met other people who feel the same way as I do on the Israel/Palestine situation and Iran, too. I have experienced Jewish-Zionist brutality all my life. I am a Palestinian Christian and never in my life involved myself in anything political just to avoid being in the clutches of the Zionists. But they never left me alone the moment they know I am a of Palestinian origin. I am subject to humiliation, mental torture and if I refuse to be subdued, I was subject to beatups and almost lost my life to food poisoning. The Jewish Zionists criminals are ruthless and they are allowed to kill Gentiles according to their so called Talmud. I am considered a sub-human just like all Gentiles including American Christians. Antihuman teachings in Judaistic Orthodoxism, Talmudic Nonsense, Kabbalistic militarism and Zionistic warmongering has to be forbiddend and banned by means of law, court, international treaty and political activism. As soon as you identify certain texts as call for criminality there should be a chance to prohibit them effectively. Best greetings to BN, you are a hero!